“You’ll be a McGuire tomorrow guys!” I excitedly told the sprouts last night before they went to bed. “Will I feel different, Mom?” Little Sprout worriedly asked. “Oh, maybe a little,” I laughed. “You’ll be more excited than usual, but other than that, you won’t feel too different. Just make sure you find something green to wear right when you wake up so that you don’t get pinched.” I light-heartedly poked her. Her worried expression returned and she said, “Pinch me? Who would want to pinch me?” She sounded panicked. She relaxed and her eyes softened. She smiled with anticipation and she and I had finally arrived at the place I had hoped to be when I brought up the topic in the first place. I love St. Patrick’s Day! I want my kids to love it too, and each year I try to remind them of some of those fun genes I have passed down to them. They are a more diluted version of Irish than I am. They are 1/4 Irish, I am 1/2 and my dad is 100 per cent Irish. It was a sad day for me when I had to learn how to write Frank instead of the glorious McGuire that I had adored growing up. Don’t get me wrong… I am very glad to be married to my husband, and to have his name, but Meagan Frank just doesn’t have the same Irish ring. So for one day a year, every person in our house is a McGuire. 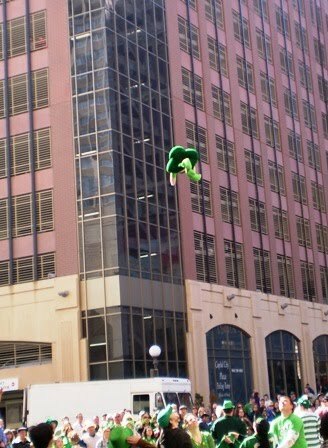 In celebration of the day, I took the kids to St. Paul for the St. Patrick’s Day parade. Who knew there were so many Irish people in Minnesota? So many, in fact, that I didn’t find a parking space for nearly forty minutes of driving around and not until after the parade had actually started. I’ll claim Irish luck that the spot we found was literally THE last spot in THE last garage I had agreed to try. We walked four blocks, found a small spot on the curb and watched the parade roll by. 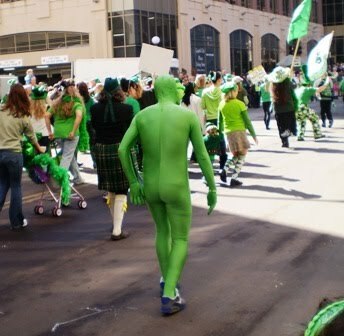 There were green men and decked out strollers. Bagpipes, firetrucks, candy-throwers, dancers and bands. 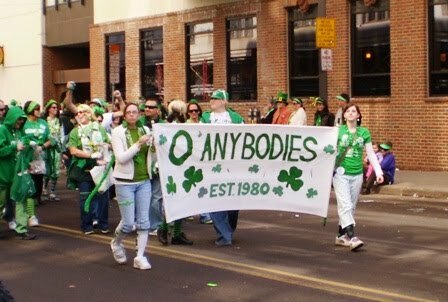 But most of all there were groups of families and friends who walked behind a banner identifying themselves as the Irish among us.Growing up, not only did I go to the St. Patrick’s Day parades in Denver, I was in a parade or two. I remember the matching sweaters and kilts my sisters and I wore and the scratchy hay that was our chair on the float. 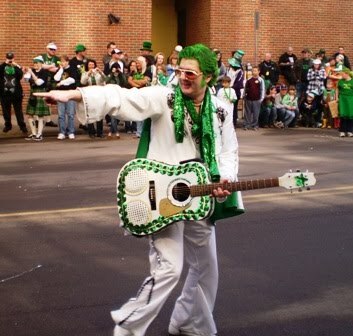 I had fun at the parades, but I never fully appreciated the holiday until recent years. I’m proud to be Irish…not just because we throw great parties and laugh intensely at foolish behavior. And we do laugh…a lot! (maybe it’s not such a good thing that we give ourselves so many reasons to be laughing) I’m proud because the Irish are a hard-working, hard-playing bunch. I think of scrappy tempers, boisterous conversations and smiling eyes. There are days I curse my Irish temper, but without it I truly feel I wouldn’t have the passion I have for every other part of my life. I hope our kids will appreciate the parts of their personalities that were celebrated today. Our cornbeef and cabbage dinner was fabulous, and the Killians has been a good way to end my Irish celebration. 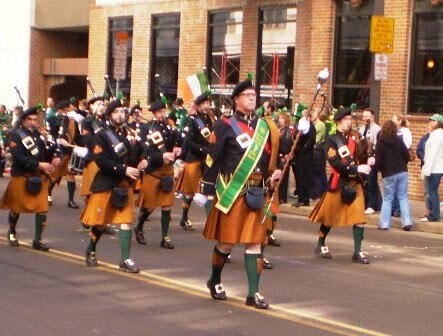 I am glad that I don’t have to wait an entire year to be a McGuire again because our clan may not have had a sect marching in the parade today, but a whole bunch of us are gathering for a five-year reunion in July…and I can hardly wait.